During the enactus UK welcome event at the Enactus World Cup 2017, we announced the winners of this years summer action competition. This years Enactus UK Summer Action Competition was sponsored by one of our new platinum sponsors, Diageo. We received a record number of applications for this years awards for the categories of Summer Action Champion and Most Improved Team; a total number of 26 applications from teams across the Enactus UK network! We were so impressed with what teams had achieved since the National Competition in April 2017. In September we announced the three finalist teams for each award; Enactus Imperial, Enactus Manchester and Enactus Surrey were the three finalist teams for the Summer Action Champion Award and Enactus Glasgow, Enactus Salford and Enactus Sussex were the three finalist teams for the Most Improved Team Award. Each of our finalist teams were asked to submit a video about their Summer Action Applications; you can view the videos here. These videos alongside the Summer Action applications were judged by a panel of Diageo employees. Yvonne Crew; Early Careers Manager, Europe Diageo joined us at our Enactus UK Welcome Event on the first day of the Enactus World Cup in London; Tuesday 26th September 2017 to announce the winners! 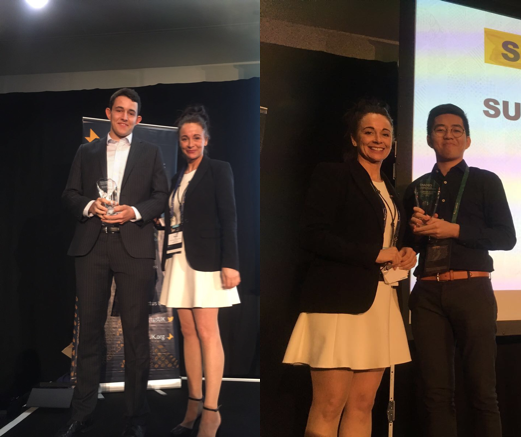 Enactus Manchester were crowned Summer Action Champions 2017! Enactus Sussex were crowned Most Improved Team 2017! Both of the winning teams received £500 from Diageo! Kenji, from Enactus Manchester who is their team leader collecting the teams award! Chris, from Enactus Sussex who is their CRE collecting the teams award! We would like to congratulate the teams from both Enactus Manchester and Enactus Sussex on their awards and hard work over the summer. We would also like to thank all the 26 teams who applied for this years Summer Action awards; keep up the good work! 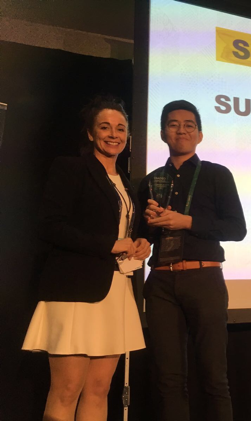 Upon receiving their award, Enactus Sussex said, "We are ecstatic to have won the Summer Action Most Improved Team Competition sponsored by Diageo. As a team, we struggled towards the end of last year with most of the team who had been in Enactus for several years left leaving very few members, we changed that over the summer. We have built up our membership with people who had never heard of Enactus before and taught them what Enactus stands for and how the Enactus process works from scratch. We started projects that we were passionate about, only keeping one existing project that has now been completely revamped. We have also worked incredibly hard to secure funding and worked with new business advisors and members of the university to ensure we can make the maximum impact this year and benefit as many lives as possible. We are incredibly grateful to Diageo for sponsoring this award as the money will allow us to accelerate these new projects, as well as giving the team a boost in motivation for recognition of their hard work over the summer. This excitement has subsequently rubbed off onto all of our new members throughout fresher’s week and our first week. A great start to the year, we can’t wait to see what the rest of it looks like". Thank you to Diageo for sponsoring this years awards and to the Diageo judges for spending the time to decide who would be the winners! Also a huge thank you to Yvonne Crew for coming down and announcing the winners during the Enactus World Cup last week!